Easily record and track cow body condition score with the BCS Tracker app. The BCS Tracker allows you to score cows in the field on your smartphone and have ready access to the results. It also takes the hassle out of recording BCS data on paper and then transferring it to a computer, it can now all be done electronically. With the following features, this app is proving to be a popular tool for farmers and staff. 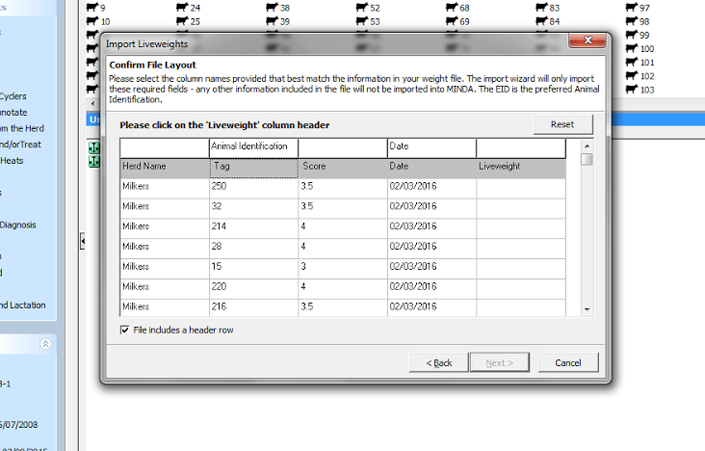 It allows for viewing herd scores and seeing change over time. Multiple herds can be scored and reported on. Cows can be flagged for a range of reasons (lame, mastitis etc) and along with their tag numbers can recorded for later reference. 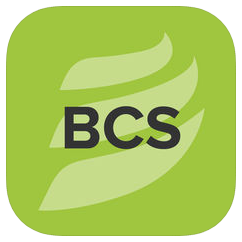 The app also contains the popular BCS field guide, so there is ready access to information and images on accurate assessment. Use the drop downs at the top to select the herd you want to report. 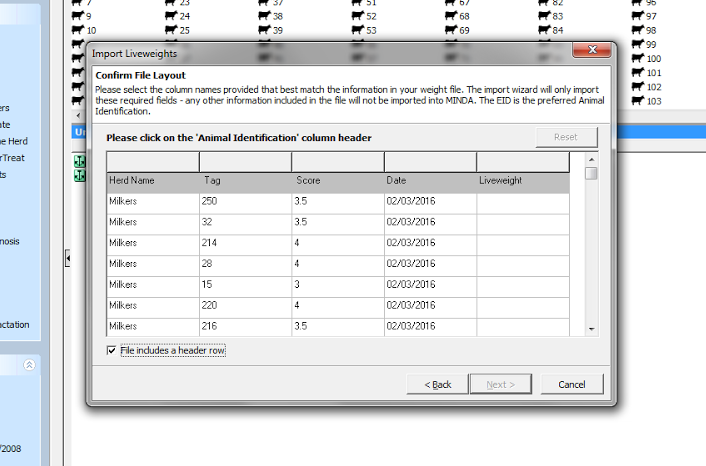 Note that if you have scored the same herd on multiple dates, all those dates will be included in the report file - you can delete them later if need be. Select email. A pre-formed email should open with the file as an attachment - put in your email address and press send. If an email doesn’t open, check that you have the email programme on your phone enabled. Send the data from the App to your email address. 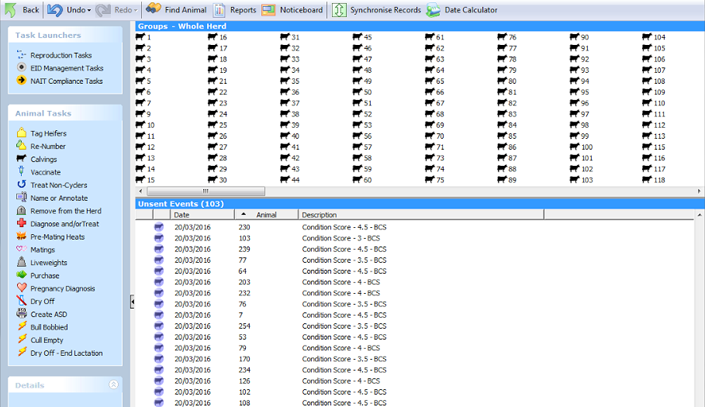 Remove old BCS data if you only want to upload the most recent scoring event - the oldest records will be at the top of the file; highlight the data, right click and delete entire rows. Save it somewhere easy to find - click 'yes' when the message about compatibility comes up. 1. If you have multiple herds in Minda, you need to be in the herd which was scored. 2. 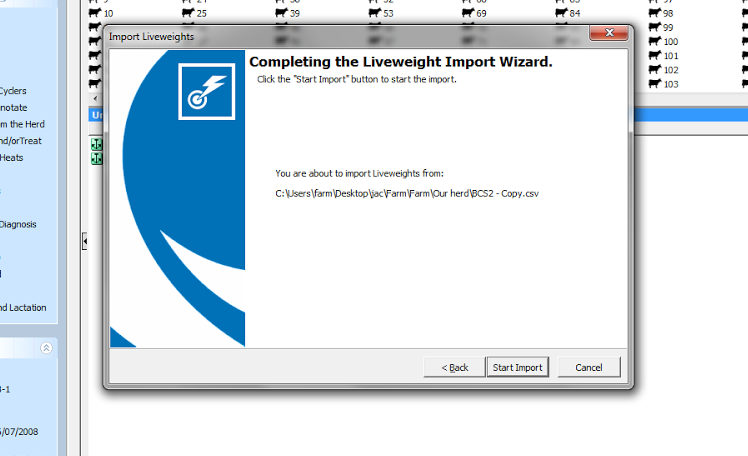 Use Import Liveweight wizard to import modified BCS App file. 3. Click next to confirm you are uploading the file to the correct herd. 5. Click browse to find the BCS app file. 6. 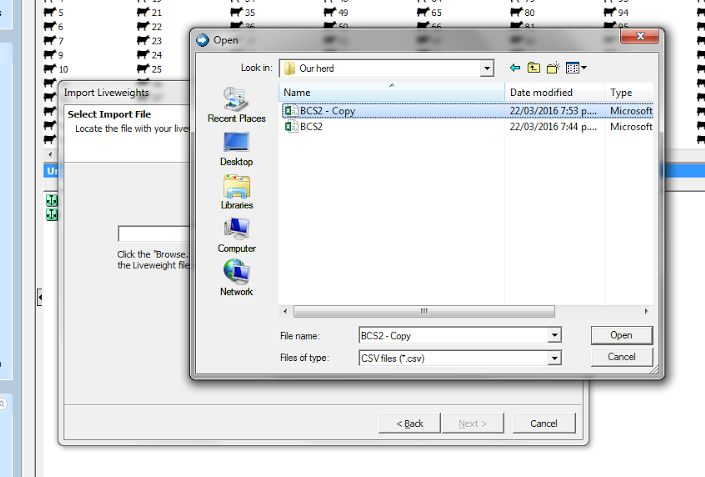 The BCS App file is a CSV file – change the Files of Type drop down to CSV. 7. 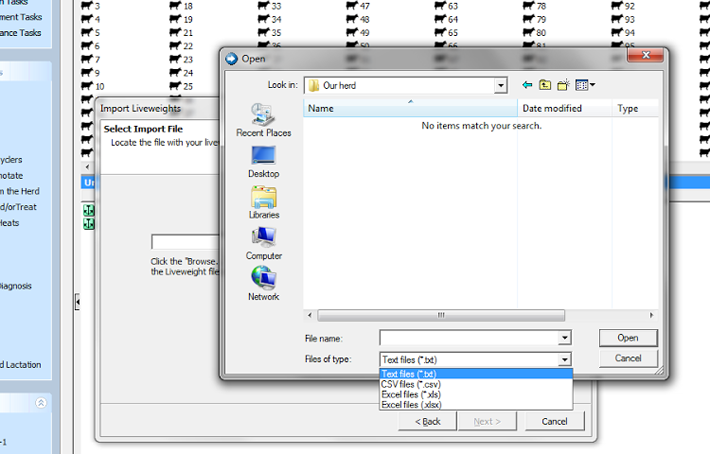 Locate the file and click open, then click next. 8. Click the tick box to confirm the file includes a header row. 10. 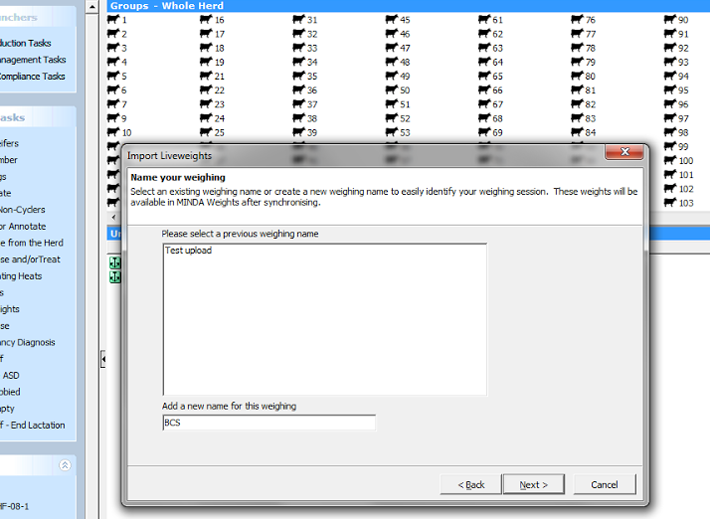 Follow the instructions to confirm file layout, i.e. identify what each column in the file is. 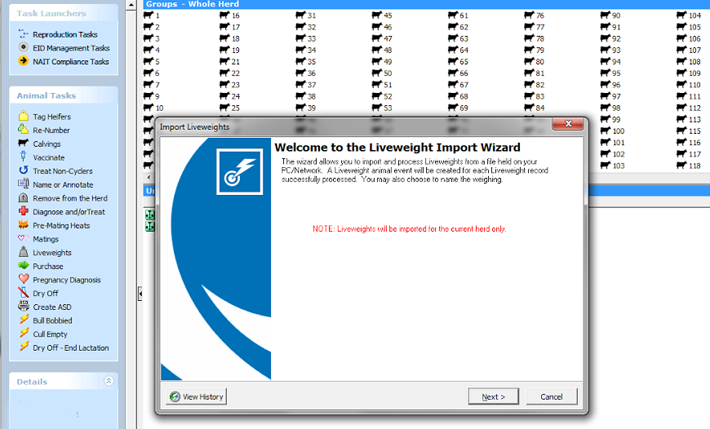 Note that it only imports columns which contain data or a title - if you haven’t added the liveweight column/title, the import will not succeed. 11. Click to start import. 12. 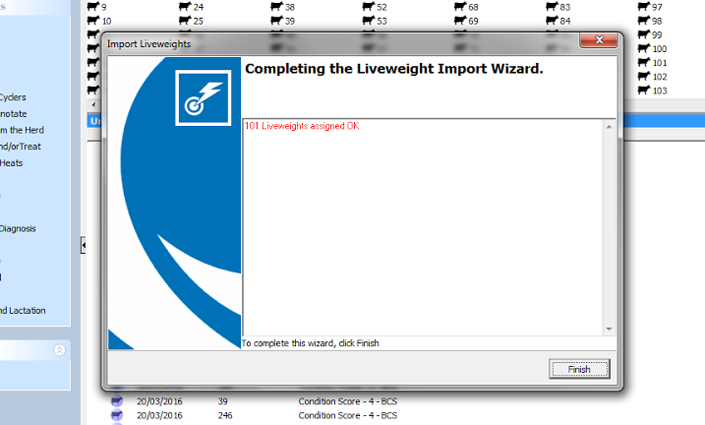 If import is successful, you should see a message that ‘X liveweights assigned OK’ and when you click finish, they’ll appear in your unsychronised events. Are you having data storage problems? We have discovered that heavy users of the BCS Tracker app can run into problems with data storage. App users should aim to keep their BCS app data storage just under 3MB (out of the 5MB limit). Where storage is above 3MB, our advice for users is to export old sessions via the ‘Send’ report feature, email it themselves, and then save the csv files on their desktop/laptops for later reference. Then you can delete older sessions on the app - by selecting the Delete Scores option from the app home page or menu.